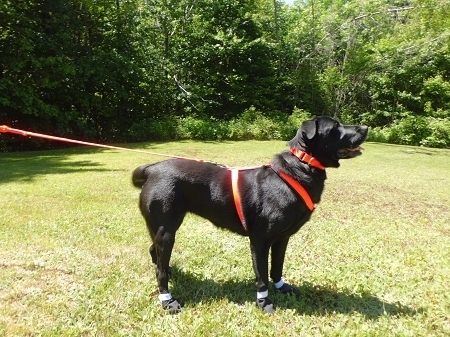 The Padded Tracking Harness is made with 3500 lb break strength nylon webbing and fully padded with 300 weight triple thick fleece, with the option for the fleece being covered with a waterproof nylon oxford fabric for $4.00 more. The harness stops halfway down the dogs back and has a girth strap with an adjustable delrin quick clip closure. 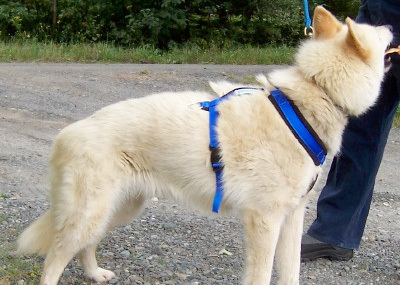 This style of harness may work better than a standard sled dog harness for skijoring because the angle of the line from skier to dog is steeper, which would cause lifting with a full length style harness. This harness fits a wider range of dog per size. The sizing is estimated at Small 19" Neck 30-40 lb, Medium 21" Neck 40-50 lb, Large 23" Neck 50-60 lb, XLarge 25" Neck 60-70 lb, Jumbo 27" Neck 70-80 lb The girth strap is adjustable. Contact us for custom sizing!